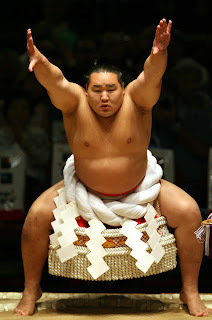 As part of their training, Sumo wrestlers skip breakfast and instead eat two gigantic meals later in the day. The main reason they skip breakfast is because they cannot train 3-4 hours on a full stomach. The side benefit is that skipping breakfast helps slow down their metabolism. By skipping breakfast and exercising strenuously for a few hours, the wrestlers are so hungry by lunch time that they are ravenous. This is also what happens to average people who don't eat breakfast. They lose control of their appetites at lunch because their last meal was dinner the night before. Weight loss experts say that one characteristic common to overweight people is that they seldom eat breakfast. Not only does skipping breakfast trigger overeating later in the day but it can also cause a five-percent drop in metabolism! 2. Eat 5 to 6 small meals throughout the day (and watch those portion sizes). Sumo wrestlers go long periods between their meals - no grazing is allowed. If you want to keep your metabolism high and chugging along at a good clip, be sure and eat a healthy meal or snack every 3 hours or so. Grazing is good! As long as the food is healthy, of course. Sumo wrestlers eat two gigantic meals, one at lunch and the other at dinner. Research indicates that eating one or two big meals a day makes your body more prone to hoarding fat compared to eating five or six small meals a day. No one is born with the ability to eat that much food in one sitting so Sumo wrestlers have to progressively train their stomachs to stretch and accommodate larger volumes. They even have special massages to move the intestines around to enable them to consume more food. So, what is a healthy-sized portion? Clench your fist and there's your answer. If possible, try to make each meal consist of a portion of protein and a portion of carbohydrates. And don't leave out the healthy fats (avocados, nuts, seeds, olive oil, cold-water fish, flaxseed etc. ), which are essential to good health. The American Heart Association has a cool calculator that will tell you how much fat you should consume daily, based upon your age and body type. 3. Lead an active life. Sumo wrestlers take a 3-4 hour nap after lunch. After they eat dinner, they retire for the night. This makes sense for two reasons. One, they want their wrestlers to conserve as much energy as possible so that most of the calories they eat will be deposited as fat. The second reason is that sleep and rest are necessary for muscles to grow. Body builders know that it is during sleep and rest time that muscles are repaired and new protein is synthesized to add to the muscle size. The weight loss lesson is that you want to stay as physically active as you can throughout the day to burn off calories and you definitely should not eat within an hour of going to bed. No amount of exercise will make you lose weight if you eat more than you burn. If you're new to exercise, start off s-l-o-w. A common mistake people make is biting off more than they can chew, and then they end up quitting exercise altogether. I suggest a walking program because it's inexpensive, flexible and easy to track (especially with a pedometer). Start out with 10-15 minutes of walking and every day add a few more minutes. In order to maintain health, you should get at least 30 minutes of moderate-intensity exercise, five days per week, or 20 minutes of high-intensity exercise, three days per week. Yet they aren't "technically" sumo wrestlers! I eat breakfast mid-morning and then have an early dinner. So, I only eat twice a day. It works for me. I'm also on the treadmill 5 days a week. Try aerobics for about 20 or the 30 minutes. It's a workout and a half. Keeps my weight down too and my heart rate for an old broad isn't half bad either. Laura, you are crazy! Great title and pic for a post! ha haaaa! By the way, looking like a Sumo wrestler can get you big props in Japan.... and in Samoa too, I'm told. Must be a regional thing! LOL! Dawn - Thanks! I know what you mean. Sandee - As long as it's working for you, that's what matters. My dad is slim and trim and he only eats once per day (but he runs regularly). Fitness Diva - Hehehehe! And you're right, I am crazy. That picture reminds me of how I look when I'm using the bathroom! 7 days on a cruise ship and I feel bigger than a Sumo wrestler!! Willy let the candy slip up on him on valentines day. Good tips. I've lost some noticeable weight. Everyone who knows me and sees me now comments on my weight loss. I've been doing the things you mentioned here along with other stuff. Furkidsmom - Wow, I bet the cruise was wonderful! My friend went on a cruise last year with her husband and two other couples. She said the food was awesome and she gained 10 pounds! Willy - :) I had to abstain this year. What I missed most was chocolate-dipped strawberries. Yum! Davida - Congratulations! That's awesome. All it takes is effort combined with commitment to see it through to your desired results. CastoCreations - Yeah, pregnancy does do strange things! I have always been a breakfast eater (eggs in particular). As a child, I would get upset when I saw breakfast consisted of cold cereal. Of course, cereal was my brothers' favorite breakfast! Stephanie - It makes sense doesn't it? I am bad about forgetting about breakfast until I've been running around doing errands and start to get nauseous and light-headed. My husband tells me that is why I can't lose weight but trying to get four kids off to school in the morning means I sometimes forget to eat.